A sophisticated AV center for the discriminating user, the Multi-Podium provides beauty and function in one versatile unit. 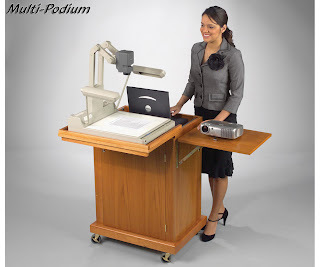 Perfect for use as a standard podium, the Multi-Podium stands out when it comes to projector presentations. A locking slide-out top holds a projector or document camera, and the 2" deep recessed area beneath is ideal for setting up a laptop. The recess doubles as storage space for a laptop or other equipment when the center is not in use. Locking doors on three sides provide easy access to equipment while also ensuring security. The generous interior storage area includes two adjustable shelves with grommets in each shelf for easy cable management. Heavy duty 3" plate casters (two locking) allow easy mobility. An optional side shelf is available for additional presentation equipment. The Multi-Podium is finished in a warm oak tone on solid oak and oak veneers. Well known for ergonomic workstations, printer/fax/audio-visual stands and computer accessories, Balt, Inc. has been the user's choice for versatile office equipment since 1985. Additionally, with their growing line of new office chairs, Balt will remain a world-class trendsetter in office and educational furnishings.